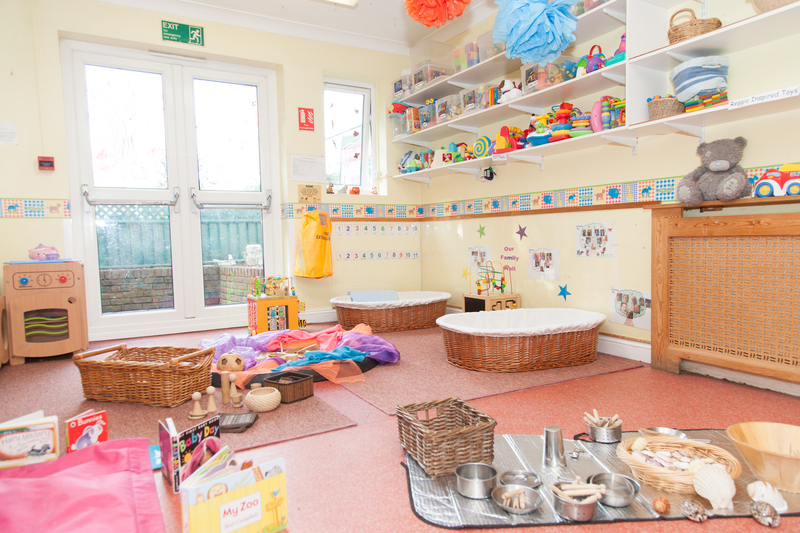 Our nursery accommodation is specifically designed and arranged to meet the needs of young and pre-school children. Our outdoor facilities are unrivaled. Our children benefit from having daily use of the biggest garden in Rayleigh for a wide range of exciting activities. In addition, we employ a gardener who works with the children sowing, planting and growing flowers and vegetables. The children are learning to compost and grow and we have noticed a significant improvement in children’s willingness to taste and eat new vegetables. Much of the accommodation is purpose-built. Although our children meet together at the beginning and end of the day and we plan time for siblings to be together at mealtimes and at outdoor playtime, we have always found that each age group benefits from stage related activities and facilities. Our baby unit welcomes the youngest members of the nursery, aged from six to eighteen months. We have a maximum of twelve children in our baby unit with a minimum staff ratio of one staff to three babies. Our babies enjoy bright, spacious, purpose-built accommodation with their own outdoor, safety surface protected play area. Covered pram parking is also available. 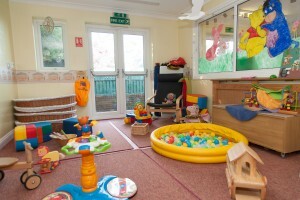 The unit has a main playroom, with its own sleep and nappy changing facilities. The unit also has a separate kitchen area to allow for breakfasts, snacks, lunches and bottles to be made throughout the day. Staff follow strict health and hygiene guidelines at all times. Babies have their own snuggle and sleep basket which allows them to rest in a secure and calm environment. The basket creates a private rest space for children in which they can play, snuggle, sit and sleep. Our older children in the baby unit will be encouraged to rest on small, child-sized beds. The unit is very well equipped with good quality furniture, equipment and educational toys. Our staff are highly trained to a minimum level three qualification and undertake regular training to ensure that they keep up to date with the very best methods of supporting children’s care and development. They regularly observe and record children’s progress against the new Early Years Foundation Stage developmental milestones, so that they can be sure of supporting each and every child’s needs. Our fun days include outdoor play, messy play with jelly, paint, glop, spaghetti, holistic play and treasure baskets to promote all round development. Planned activities, such as ‘tummy time’ ensure good mobility and physical development. Our baby unit often go out into the community in our 6 seated turtle bus, they take trips to King Georges’ park, Rayleigh Windmill, Rayleigh Mount and many more. 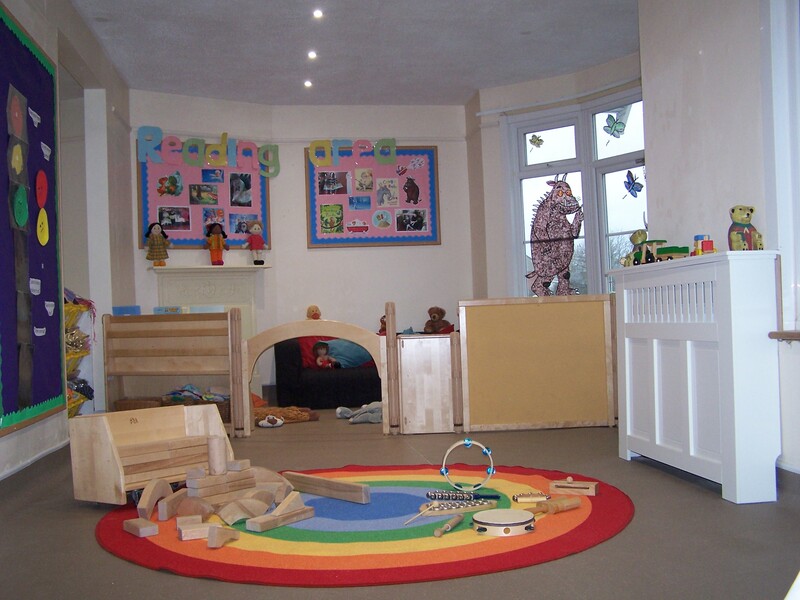 In our toddler room we welcome ten children, a good size group with a sufficiently diverse range of personalities to help children develop good personal, social and emotional skills. The children have a large, spacious playroom with good quality messy play equipment, art and craft and learning resources. Small stacking beds are available for daily short naps. In this room, our staff are also highly trained to a minimum level three qualification and undertake regular training to ensure that they keep up to date with the very best methods of supporting children’s care and development. The staff are active in assessing, planning and monitoring activities to ensure that children’s choices are respected and that individual needs are met. As well as enjoying an exciting range of projects, art and craft activities and free play, the children are starting to sow, plant and grow seeds and enjoy a wide range of exciting indoor and outdoor activities. 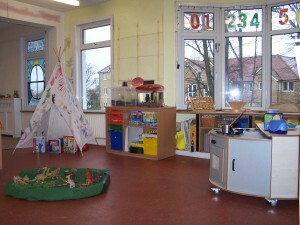 The pre-school room is modelled on local school nursery classes. This enables children to learn to work and play, with confidence, in a similar environment, thereby ensuring a smooth transition to school at four or five years of age. The room is very large and provides ample space for good quality play and learning opportunities, for a maximum of twenty six children. The room is divided into specific areas of learning, such as the educational area which houses the book corner, the computer, the language and mathematics tables. 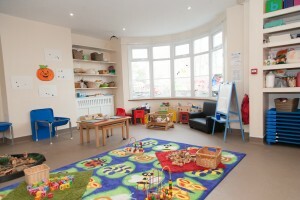 The carpet area provides room for whole-group time, such as registration, circle time and story time. 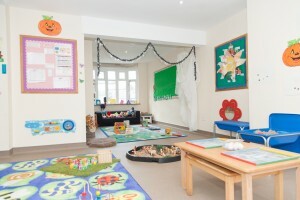 The room also has an exciting, dedicated role-play corner where children act out scenes from a range of role play scenarios, such as a restaurant, a hospital, a beach, a smoothie bar, a jungle etc, etc. Our resources are sited at child height and children are encouraged to self-select, for example if they wish to design and build using our wide range of construction resources. 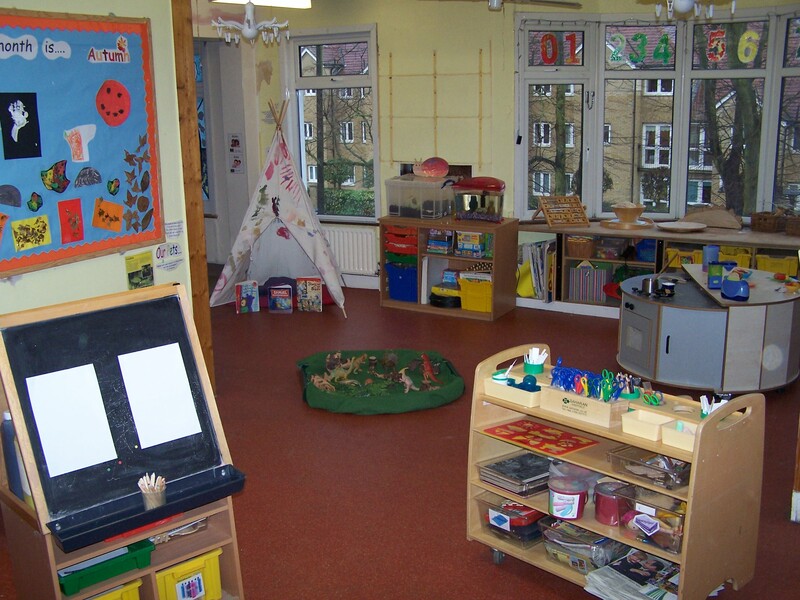 One corner of the room is dedicated to messy play, where children can explore their own creativity through media such as art, craft, sand, water, painting and malleable materials. The staff team in the pre-school room is once again very well qualified to a minimum of level three. Ratios are higher than regulation requires with one staff for 6.2 children instead of the statutory one staff for 8 children. Activities and daily routines are of a high quality and reflect the knowledge and expertise of the early years team. Pre-school children have daily access to the large outdoor facilities and work closely with the gardener to plan which vegetables and flowers they will plant next in our award winning nursery garden. My son loves it there, he has special bonds with the staff and is very happy to attend there every single day, even though they are long days for him. In my view his needs are met consistently and in many examples exceeded. I have absolute confidence in ensuring my sons safety and well being and promoting his independence and learning.